The category of “clean” beauty (toxin-free, cruelty-free and eco-friendly makeup and skincare) has gone mainstream. Farmacy, Indie Lee, Drunk Elephant and Tata Harper are just some of the clean indie beauty brands that have tackled how to source and manufacture makeup with all-natural ingredients. But not as much attention has been paid to the brushes used to apply cosmetics. 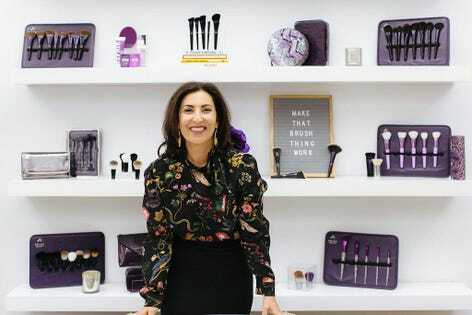 Anisa International, which makes cosmetic brushes as well as makeup bags, storage organizers and brush cleaners, aims to become a global leader in the ethical manufacture of these tools. “We can do what we do a lot cheaper, but I wanted to do it in a way that the quality of products, the care of our environment and how we treat our team mattered as much as the sales we get,” said Anisa Telwar Kaicker, the company’s founder. For starters, Anisa opted out of using animal fibers for bristles and aims to reduce its company’s landfill waste by 20% each year. Before launching Anisa in 1992, Kaicker worked for her mother’s $100 million import-export business in Georgia which introduced her to beauty manufacturers, the majority of them men who she felt were not aware of the purpose of each brush in a woman’s beauty routine. “There are a lot of brushes on the market, but many of us forget that a brush . . . touches your face every day in an intimate way,” Kaicker says. Anisa International now produces brushes for some of the biggest beauty brands, including Estee Lauder, Nars, Tom Ford, Shiseido and Smashbox. Kaicker says the Atlanta-based company will pull in more than $50 million in 2018, with a workforce of 550 employees, 90% of whom are female and work in Anisa’s factory in Tianjin, China. When Kaicker opened her first facility in China in 2002, she was aware that many American companies with manufacturing in Asia were guilty of violating workers’ human rights. So she decided to invest in hiring a management team with a record of properly training and treating employees. Anisa first ensured that the factory was well ventilated and offers workers sufficient break times, vacations and recognizes Chinese holidays. Kaicker decided to take extra steps to integrate her Chinese employees. “We decided to implement a global culture,” she says. “How I treat our U.S. team is how I treat the team in China. Everything has to be fair.” She makes sure the management team in China recognizes work anniversaries, distributes bonuses and keeps tabs on the professional development of each employee. “It’s about showing them they matter,” she says.